So much cool stuff has been going on. Happy to announce BC5 was featured in Downbeat and Jazziz. 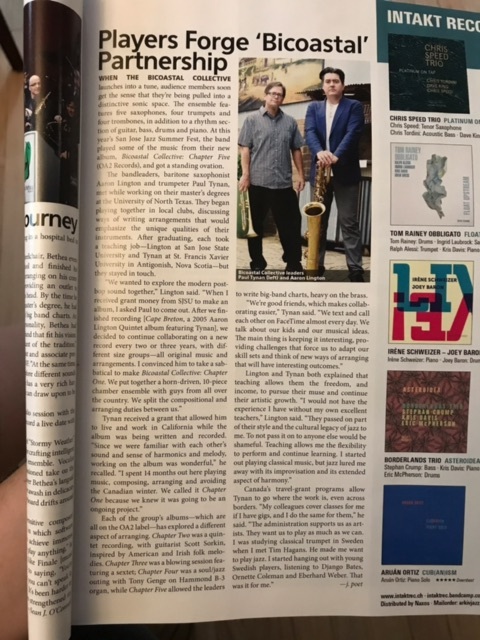 The Downbeat feature was a full page feature (Nov. 17) and Jazziz (Fall 17) included Aaron’s “I Remember Everyday” as the 2nd track on their fall CD. Our gigs on the west coast were fantastic and we added two new amazing musicians to the BC family: LA based guitarist, Mike Scott and Bay Area B3 wizard, Brian Ho. If you like to sample BC5 here’s a bandcamp link to do just that! ← Bicoastal Collective West Coast GIG!